Where are your photos? Lost in shoe boxes, stuck in outdated albums, envelopes and under the bed? Are your filing cabinets overflowing, not sure what documents you need to keep, want to keep documents that are a part of your life story? We come to you to complete all your notary needs. 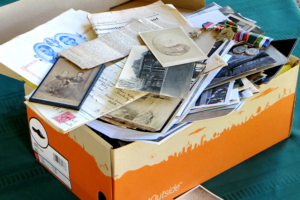 Photographs, photo albums, and documents are the insight into our lives, and tell the story of who we are. They are as unique and special as the people they include. They deserve to be protected, and preserved. You will regain your storage space by allowing you to dispose of bulking storage boxes, filled filing cabinets. Becoming digitized will allow you to share your photos via email, create a DVD Video slide show, create memorial slide shows, post to social media and provide a simple way for you to transfer them to the next generation. • Provide an Archival DVD or flash memory, and place the files on your computer. Additional services: Further photo organization, creation of photo books, dvd slide shows, memorial slide shows, supporting insurance documentation for coverage. We are mobile —- we come to you. Your precious belongings do not have to leave your home or office. Other companies require your precious pictures to be either dropped-off or shipped to various facilities all over the world, which could take weeks or months. With digital4keeps scanning services you receive your scans instantly at the conclusion of your appointment. Where are your photos? Lost in shoe boxes, stuck in outdated albums, envelopes and under the bed? When was the last time you actually looked at photos of your grandparents, your wedding, your own childrens’ baby pictures? How Many Printed Photos Are There?